St. Thomas Aquinas is known most for his intellect and prolific writing. His theological treatises continue to serve the Church today, and through his work we have a better understanding of many intricate details of the faith. Yet Aquinas’ primary focus was not knowledge. His special gifts happened to be great understanding and wisdom, but to Aquinas, they were not ends in themselves. All of his work flowed from his love of God and his openness to the Holy Spirit. It was great devotion that led him to contemplate God’s truths so deeply, and it was obedience to God’s will that led him to write so extensively. Through his contemplation, Aquinas gained an intellectual understanding of the faith, but a deep spiritual understanding as well. At the request of Pope Urban IV, Aquinas wrote five Eucharist hymns for the newly instituted Feast of Corpus Christi, including the verses O Salutaris Hostia and Tantum Ergo. These hymns reveal the depth of his contemplation of the Eucharist. They are sung to this day on the Feast of Corpus Christi and during Eucharistic adoration and benediction. St. Thomas’ intense devotion is manifest in one incident that took place in a Dominican convent. 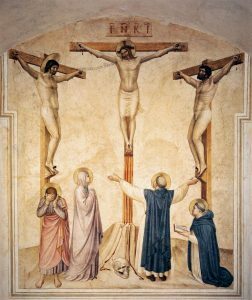 While Aquinas was praying before an icon of the crucified Christ in the Chapel of Saint Nicholas in Naples, the church sacristan witnessed Aquinas so rapt that he began levitating. Ineffable Creator, Who out of the treasures of Thy wisdom hast appointed three hierarchies of Angels and set them in admirable order high above the heavens and hast disposed the divers portions of the universe in such marvelous array, Thou Who art called the True Source of Light and super-eminent Principle of Wisdom, be pleased to cast a beam of Thy radiance upon the darkness of my mind and dispel from me the double darkness of sin and ignorance in which I have been born. The St. Paul Center is partnering with the Aquinas Institute for the Study of Sacred Doctrine to make translations of Aquinas’s works available in English. Learn more about this endeavor.